Making bread without a bread machine used to seem so daunting. That is, until I took a series of professional Artisan Breadmaking courses about 6 years ago, where I learned to make all kinds of bread from scratch, by hand. We never even used mixing bowls. We’d just mix the dry ingredients together, on the surface of our work bench, then make a well in the middle, and add in the liquids. This is how I’ve made bread ever since – kneading by hand with only the help of a dough scraper. My favourite has always been the enriched breads, which have the addition of butter, eggs and sugar in the dough. I love the rich taste and soft texture of the breads. I’ve made a lot of challah, raisin bread and panettone. I learned breadmaking using fresh yeast, so this is what I prefer to use. However, it’s not always easy to find fresh yeast because retail stores don’t sell them. You have to actually go to a bakery or the bakery section of a supermarket and ask to buy some fresh yeast off them (and they won’t always sell to you either). Last week, however, I was given almost a 1 pound cake of fresh yeast, leftover from some friends’ baking. I hadn’t baked bread in at least a couple of years, so I was super excited at the thought of making bread again. 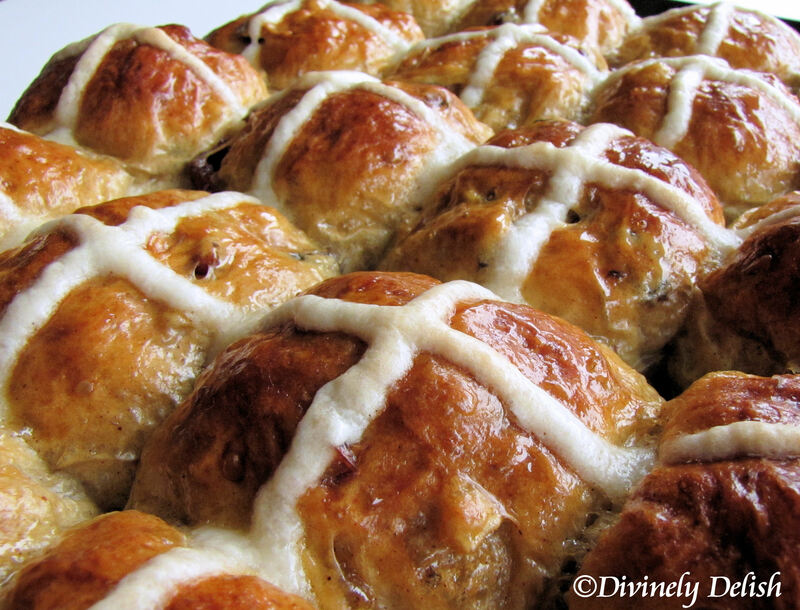 I decided to start off the Easter long weekend making hot cross buns, which are traditionally eaten on Good Friday. 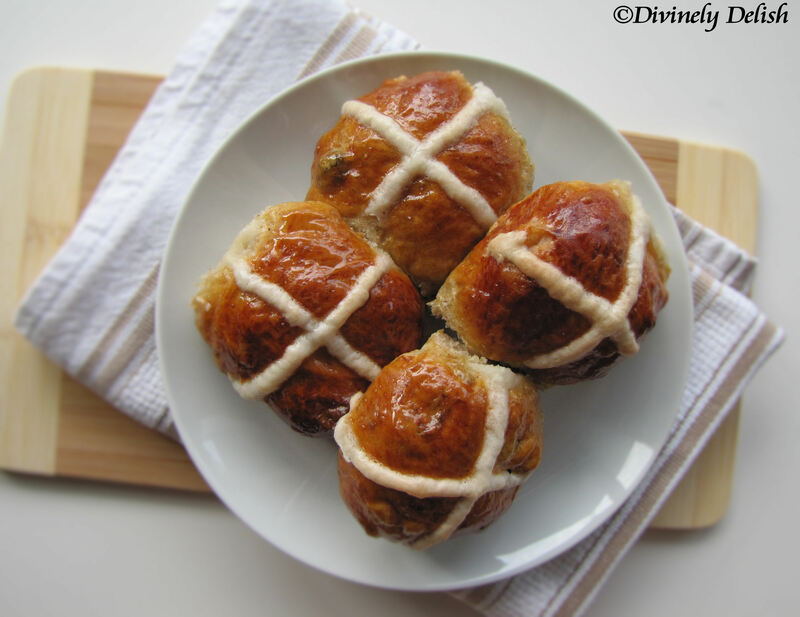 This recipe has a few more ingredients than most recipes that I came across, but it’s the recipe from Gail’s Bakery in London, and their hot cross buns were rated #1 in a taste test in 2013. 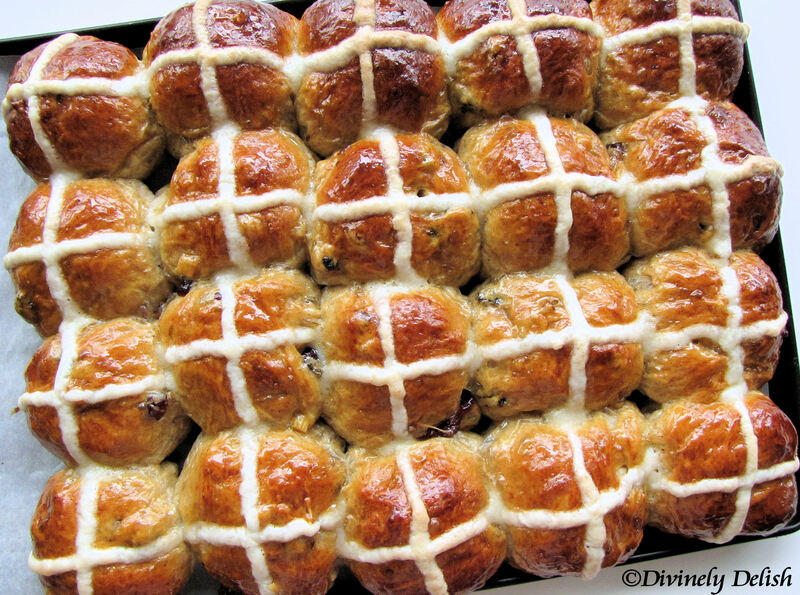 I have to agree…these were the best hot cross buns I’ve ever had! 1. Mix the flour and caster sugar in a bowl. Rub the yeast into the mixture using your fingers (in much the same way that you would rub butter into flour when making crumble). 2. Make a well in the middle of the mixture. Add the cinnamon, nutmeg, mixed spice, salt, milk and egg. 3. Begin to bind the mixture together, using your hands, for 4-5 minutes until it forms a rough dough, then add butter a chunk at a time while kneading the dough. 4. After adding all the butter slowly – it should take about 2-3 minutes – you will have a sticky dough. Continue kneading for 5 minutes more until it is smooth and shiny. 5. Add the fruits and knead for 3 minutes. 6. Cover the bowl with a tea towel and leave at room temperatuare for 1.5 hours, until it doubles in size. 7. Pour the dough onto a lightly floured surface and divide into 20 pieces at 50 g each. Roll the dough pieces into shape by rolling them on a surface against your palms to create smooth buns. 8. Arrange all the buns on a baking tray lined with baking paper, leaving about a 1 cm gap between them. Cover the tray with a clean tea towel and leave to rise at room temperature until almost double in size. 9. When the buns are ready (the sides of each bun should be touching and you almost shouldn’t be able to see the tray), make an egg wash by whisking 1 whole egg plus an egg yolk and milk. Brush the buns with egg wash and leave to dry out for 10 minutes. Brush again. 10. Preheat oven to 200C / 400F. 11. Using a hand whisk, combine all the cross topping ingredients into a smooth paste. Fill a plastic piping bag with the mixture and cut a small hole at the tip. 12. Pipe thin crosses on top of the buns and then place in the oven. Immediately, reduce the oven temperature to 180C / 350F and bake until the buns are golden (20-22 minutes). 3-4 minutes, until you have a syrupy consistency. Remove from the heat and discard the spices. 14. Once the buns are ready, take them out of the oven and carefully brush them with the hot syrup.